Like in June, I processed the downloaded Dotlan data for July 2015. Let's see the ratting charts first: I've deleted the points for the long downtime to avoid ruining the trends. Which are historic: for the first time ever, there was more ratting in nullsec than in highsec. We can say that the "carebears to null" Sov upgrade plan of Fozzie worked. Even better, look at the 3-days average graphs (thin lines). Highsec is oscillating weekly, because human players play more on weekends. Nullsec has little oscillation, due to being populated by nolifers and bots. However in the last two weeks the same oscillation appeared. So not new bots were planted, but real players were lured from highsec to nullsec. Good job Fozzie! 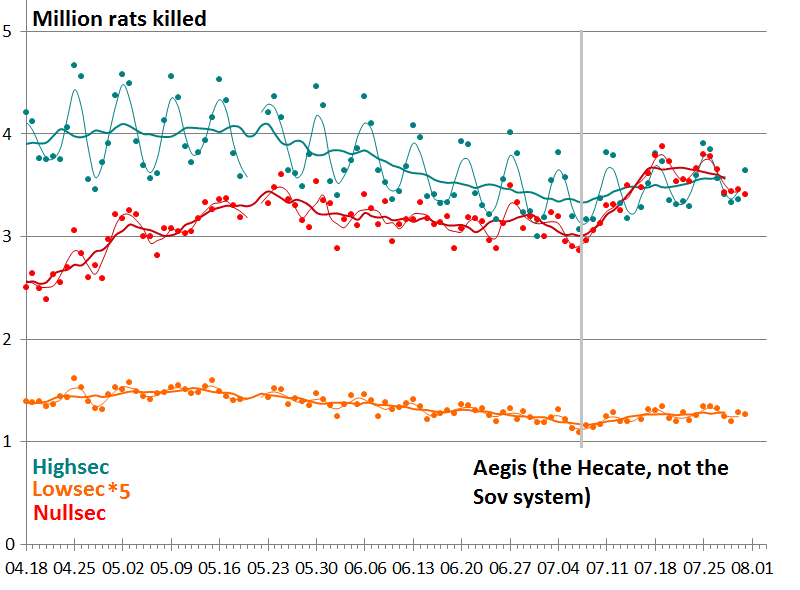 Also, both lowsec and highsec shown a small increase, so the total PvE activity grown a lot in the middle of the Summer. Aegis will probably be remembered among the best patches. Let's see the nullsec regions! The biggest winners were Tribute, Fade, Period Basis, Pure Blind and Etereum Reach. The biggest losers: Cobalt Edge, Querious, Immensea, Stain and above all The Spire that fell out of the picture. The ratting density of both Goons and FCON reached bizarre levels. You can't throw a Stratios without hitting a ratter. The two traditional renters, XWX and B0T on the other hand are collapsing. XIX (Legion of xxDeathxx), TNT, TRI and RED fail to utilize their space and will likely lose some of it (one of them to MoA). Ruca Emperor jumped out of nothing 3 months ago and now holds one of the most utilized Sov. SMA keeps increasing ratting. So far nothing is groundbreaking, but when I looked at the #4 ratter, I didn't know to cry or laugh. Sic transit gloria mundi, especially that SMA!!! is taking systems from them. Dear orphans of Elo Knight, if your EVE plan is not "literally rat more than SMA and get dunked by them", join MoA! The absolute number of Imperium (CFC) ratting in July was all time highest. However it's a slight decrease in percentage of total, so others grown more. Still, more than 1/3 of the ratting bounties went to Imperium wallets. According to this old 2013 Feb data, 32T ISK was paid for ratting bounties, but obviously not all for nullsec. 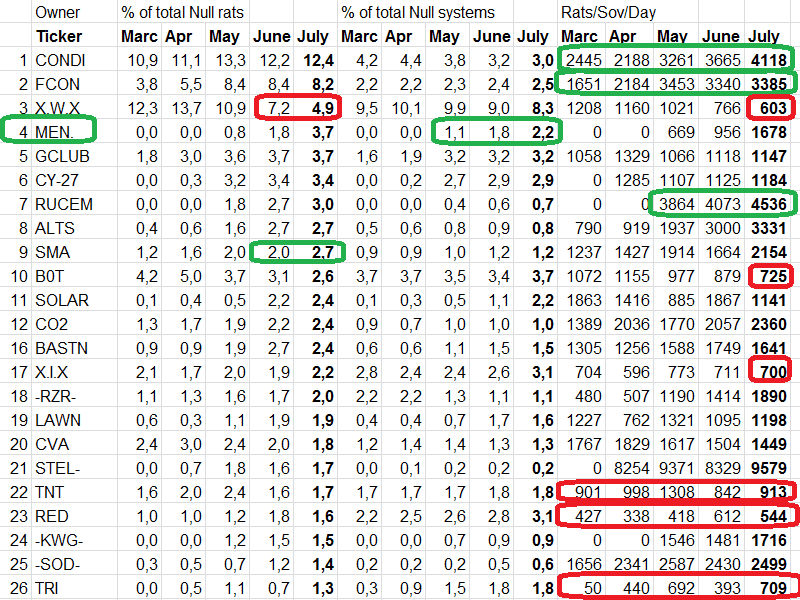 As bounties increase with decreasing sec status, we can estimate around 25T payout for 81M dead rats. This means that the 36.7M rats of the Imperium netted them around 11T ISK. That's some serious ISK, and they lose only around 3T a month. However if you divide it with 40K pilots, you get mere 270M/month income. That's not so intimidating, isn't it? Could you add the total ratting for all sec status ? I wouldn't weigth the last month too much. A lot of ratting took place just to update sov indexes. Ratting StratOps were not uncommon during the last days..."
yes true, but index must be kept up, so ofcourse it will continue. i saw some internal ratting statistics. it is crazy how much members rat. i would never do it, but it is done. there are a lot of people who rat more then 3x value of an ishtar a day. and i mean a lot. i dont think you can have an impact with inflicting this small amount of damage cause of some ratting losses. as much more is earned, and it is really unbelievable much more. they rat like crazy. yes i know, not all. but also mr. casual will earn his ishtar back very fast. afk-ishtar brings you 60mill per hour, per acc. i was just suprised by the numbers, how people can hang around so long in the pc and do stupid things like ratting. afk-ishtar brings you 60mill per hour, per acc. Didn't they change Drone agro to counter this? I'm a bit out of the EVE loop, I thought they did that so there couldn't be afk-play. Using your calculations including the imperium losses, that means that on average the imperium members walk away with a 200 M profit each month. From ratting alone. 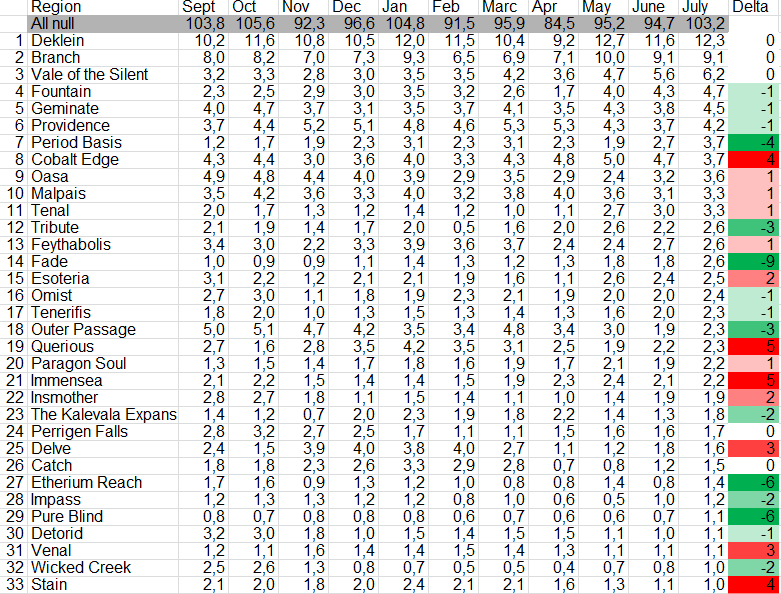 And since you've also shown these numbers don't actually fluctuate all that much, that means this month is not a fluke. Add to that the income from PI/Moons/Trading/Etc and that means that being a member of the imperium means a pretty well protected positive income each month. Now you can of course point out that there are people out there that make more each month, but does that matter? Most people I know in the Imperium do not play to make ISK, but rather make ISK to play the way they want. My point isn't that this money is lower than trader or incursion or C6 money. My point is that it's veldspar miner money, so even moving to highsec is an option to disgruntled bees who were ganked more than they can handle. You are only quantifying total destroyed, not total disruption. For every ship the gankers catch, they scare off a few more or make them dock up for a while. The better the player, the more likely they are to dock up, so it hits the human players harder than the bots. And 270m a month is pathetic. A highsec care-bear (of which I used to be when I played) can make that every day on a bad day. Its really quite terrible. Even the lower end noobs in eve should be able to make that on a weekly basis (except the veldspar miners, but miners are hopeless in general. 4th curve : sum of the 3 others. yes cause it is not 270m a month. deviding it by 40k pilots is just wrong. most nullsec guys have 3 chars per 1 account. and then maybe 2-3 alt accounts. there you go. Hey, just fyi, a 100mio passive speed tank VNI can solo afk a haven. I haven't lost one (I run 5 of these) for 7 months (and I have at all times a couple of them in my Jewing system in case my Jew fleet gets holocausted). It doesn't matter if I lose a VNI as long as I run 3 havens before I lose it again ;) )Same with the others players. If you hope it will stop anything it's pretty pathetic. BL was always the Elo Show, without him they're not about much. It's enlightening how much the success of groups hinges on the action of just a few individuals ,or in many cases, just one.